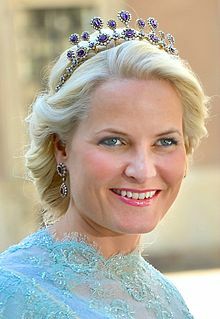 Mette-Marit, Crown Princess of Norway (born Mette-Marit Tjessem Høiby, [ˌmɛtːə ˈmɑːrɪ ˈçɛsəm ˈhœʏbʏ], on 19 August 1973) is the wife of Crown Prince Haakon, heir apparent to the throne of Norway. She was a controversial figure at the time of her engagement to Haakon in 2000. She became crown princess of Norway upon her marriage in 2001. In this role, she has championed humanitarian projects and arts, as well as taking part in official visits at home and abroad. In October 2018 she was diagnosed with pulmonary fibrosis, which will limit her official programmes. ↑ Nygaard, Fridtjof (3 November 2005). "Sven O. married today". Retrieved 22 July 2012. ↑ Evans, Morgan M. (25 October 2018). "Princess Mette-Marit of Norway reveals she's been diagnosed with chronic lung disease". Fox News. Retrieved 25 October 2018. This page was last changed on 20 November 2018, at 06:07.